With the ninth highest rate of incarceration in the nation, Arizona has become the incarceration capital of the western United States. The rate of prison population growth in 2002 was twice the regional average and the state incarcerates women, Latinos and African Americans at higher rates than its neighbors. Arizona's high incarceration rate is driven by a rigid mandatory sentencing system that severely restricts judges' discretion in imposing sentences and crowds prisons with non-violent substance abusers. Mandatory and lengthy "enhanced" prison terms are required for a variety of offenses, regardless of the facts in the case or the seriousness of the underlying conduct. Except in cases involving first-time defendants charged with low-level property or drug offenses, the system places all sentencing discretion in the hands of prosecutors. If incarceration were the magic bullet that tough-on-crime advocates claim, Arizona's reliance on imprisonment might be justified on crime-control grounds. Yet the state has the highest index crime rate in the nation and lags behind both neighboring states and the nation as a whole in crime reduction. The current level of corrections spending is straining the state's ability to meet other critical needs. Arizona ranks 49th among 50 states in per pupil spending while state universities doubled tuition to make up for steep budget cuts in 2003. Yet Justice Strategies projected that new permanent prison beds authorized by the legislature would increase annual prison operating costs by over $60 million while covering just a fraction of the projected deficit in prison beds. Under Arizona's mandatory sentencing system, people convicted of nonviolent offenses make up the majority of state prisoners. One in four is serving time for a property offense, one in five for a drug offense and one in 12 for driving under the influence (DUI). The majority are serving time for low-level offenses. A handful of non-violent offenses -- including DUI, forgery, fraud and theft -- are fueling nearly half the growth in the prison population. Arizona's sentencing enhancements make little or no distinction between serious and petty offenses and criminal records. The result is long sentences for non-violent and often low-level offenses. The majority of those admitted to prison for DUI are serving average terms of over three years. Those sentenced to prison for drug possession receive prison sentences of three-and-a-half years on average. And people sentenced for non-violent offenses with the repeat offender enhancement serve average prison terms longer than those imposed on most convicted of violent offenses. Within Arizona, there are sharp disparities in how different jurisdictions use costly prison beds -- differences that do not correlate with crime rates. Thousands of prison beds could be saved by bringing incarceration rates for people convicted of non-violent offenses in Maricopa County and a handful of rural counties in line with the rest of the state. Proposition 200 diverts hundreds convicted of first- and second-time drug possession from prison to treatment and saves taxpayers over $6 million a year. But because the measure applies only to personal drug possession and not low-level drug sales or other drug-related crime, Arizona continues to lock up thousands of people whose substance abuse, from a crime control perspective, would be better addressed by treatment in the community. In fact, non-violent substance abusers make up half of all prisoners. Arizona already has in place cost-effective, community- based treatment programs but mandatory sentencing laws and a lack of funding prevent them from meeting the need. The state's drug courts, well regarded by criminal justice professionals, enroll just 764 defendants while the state incarcerates over 10,000 people with severe chemical dependencies for non-violent offenses. A re-entry program for prisoners convicted of drug offenses established in 2003 had room for just 200 participants although 4,800 could be eligible. Women are the fastest-growing segment of the prison population yet also commit the least serious offenses by any measure. The number of women behind bars grew 58 percent between 1998 and 2003 and will have doubled by 2008 according to DOC projections. Three-fourths of incarcerated women are serving time for non-violent offenses and over half for low-level offenses. Three-fourths of women prisoners are assigned the highest possible alcohol and drug needs score, over half are methamphetamine users and one-quarter have serious mental health problems. Arizona incarcerates African Americans and Latinos at higher rates than any neighboring state and both groups make up a significantly greater proportion of the prison population than the state population. The overrepresentation of minorities in prison is particularly pronounced among those serving time for drug and DUI offenses. Justice Strategies' analysis found that African Americans and Latinos consistently received longer prison terms than whites with similar prior felony records. As Arizona considers spending hundreds of millions to expand costly prisons, other states are moving toward smarter, less expensive sentencing and correctional strategies. Arizona should follow their lead. The state's sentencing laws are broken, and only a complete revision of them will assure that justice is served and ever-rising prison population does not bankrupt the state. The governor and the legislature should appoint a top-level policy commission to conduct a comprehensive review of the mandatory sentencing laws, determine the causes of the prison overcrowding crisis, and recommend pragmatic reforms to bring the prison population growth under control. Give judges the power that prosecutors already enjoy -- to set aside mandatory prison sentences and sentence appropriate defendants to treatment rather than prison. Initiate a comprehensive study to determine the causes of overrepresentation and sentencing disparity affecting Latinos, African Americans and other people of color. Fund drug and DUI courts and make then a sentencing option for all people convicted of non-violent offenses that have underlying substance abuse problems. Make probation a sentencing option for more people convicted of nonviolent offenses and make use of effective alternatives, such as drug or mental health treatment, for probation violators. Support county efforts to invest in community-based treatment and provide local jurisdictions financial incentives for using alternatives to incarceration. The report was coauthored by Justice Strategies analysts Judy Greene and Kevin Pranis. Respected Republican Rep. Bill Konopnicki (R -- Stafford) and Sen. Carolyn Allen (R -- Scottsdale) welcomed the release of a report blaming the growth in incarceration on Arizona's rigid mandatory sentencing laws, and they pledged to support legislation establishing a sentencing commission to study the matter. 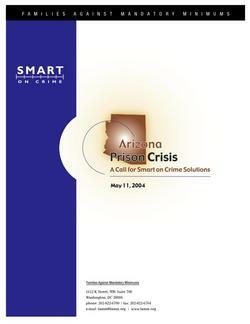 "Arizona Prison Crisis: A Call for Smart on Crime Solutions" was Commissioned by Families Against Mandatory Minimums (FAMM) and released at a May 11, 2004 press conference. The report provides policymakers with the first detailed look at the state's prison population and the specific laws that fuel the current overcrowding crisis. Please designate your donation to Justice Strategies, thank you.